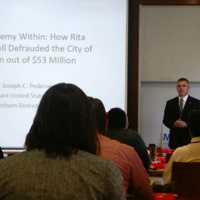 Joseph Pederson presents on how investigators uncovered the largest municipal fraud case in U.S. history. Webster University's George Herbert Walker School of Business & Technology was the proud host of this year’s Midwest Financial Fraud Investigator’s Conference. The organization was formed by law enforcement and financial institution investigators in order to exchange information regarding individuals who engage in criminal activity. They have been extremely successful in identifying fraud rings, suspects and criminals, and thereby aiding in the prevention of fraud losses. The organization has also assisted with exigent investigations to include homicides, home invasions, and child abductions. “We’re proud to build a relationship between the Walker School and MFFI,” said professor Rich Dippel said, speaking at the opening of the conference. Dippel went on speak about the link between work that the conference members do and the degrees that the Walker School offers, such as Forensic Accounting and Cybersecurity. The conference presenters included AUSA Joseph. C. Pederson, who revealed how Dixon, Illinois, investigators took down Rita Crundwell, perpetrator of the largest municipal theft in U.S. history.